Ice-cream is incredibly easy to make - and sugar free versions are no exception. What you do need to think about before you get started, however, is timing. It’s vital not only to leave enough time for your ice-cream to freeze but also for it to be whipped up several times. This is essential if you want your ice-cream to be soft enough not only to serve but also to eat! Fruit ice-creams are among the easiest. When opting not to use sugar you can use alternatives such as granulated sweetener or honey. 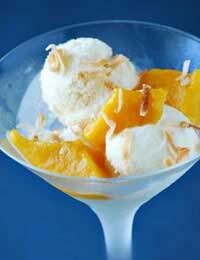 Where possible, however, it is nice to use the natural sugar in your fruit to sweeten your frozen dessert. When made without sugar, this dish is somewhat tart. This sharp edge, however, works beautifully with the icy temperature of the ice-cream and is great for clearing the palate after a meal. Make sure your mangoes are soft and ready to be eaten. Carefully peel them and remove the stones, saving as much flesh as possible. Squeeze your lime and puree along with your mango flesh, using a hand blender or food processor. Add your cream and whiz until there are no lumps. Take a clean airtight container, with a fitted lid, and pour your mixture in. Place in the freezer for two to three hours or until half frozen. Remove and whiz up again. Repeat the process at least once more, preferably twice. This creamy fruit ice-cream is a real summer favourite. If you enjoy pieces of fruit in your ice-cream, hold a few strawberries back, chop them up and then mix the pieces in before freezing. Wash and hull your strawberries. Peel your ripe bananas. Using a hand blender or food processor, puree your strawberries and bananas together. Add your cream and blend until smooth. Take a clean airtight container, with a fitted lid, and pour your mixture in. Place in the freezer for two to three hours or until half frozen. Remove and whiz up again. Repeat the process at least once more, preferably twice. This sugar free ice-cream has a delicious fresh fruity flavour. The honey complements the melon and also brings an added sweetness. Try substituting the cream for natural yoghurt to make a tasty frozen sugar free yoghurt dessert instead. Scoop out your ripe melon flesh, throwing away the pips and the peel. Squeeze a lemon and blend your fruit, juice and honey together using a hand blender or food processor. Add your cream and blend until smooth. Take a clean airtight container, with a fitted lid, and pour your mixture in. Place in the freezer for two to three hours or until half frozen. Remove and whiz up again. Repeat the process at least once more, preferably twice.